World Cup of Music: More Results, More Matches – Voting open! Onwards and upwards. More results and more contests for you to vote on. Don’t forget you can still vote on all the matches below – get your votes in (i.e. send your match scores, i.e. 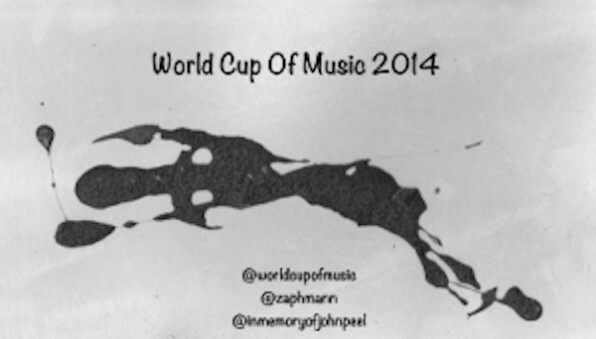 1 – 2, 3 -3 etc) either on an email to IMOJP@zaphmann.com or via twitter by “@ing” @worldcupofmusic. Oh, and in case you haven’t noticed already the podcasts start automatically playing when you load a page to be prepared to have to quickly scroll down the page and stop them playing! 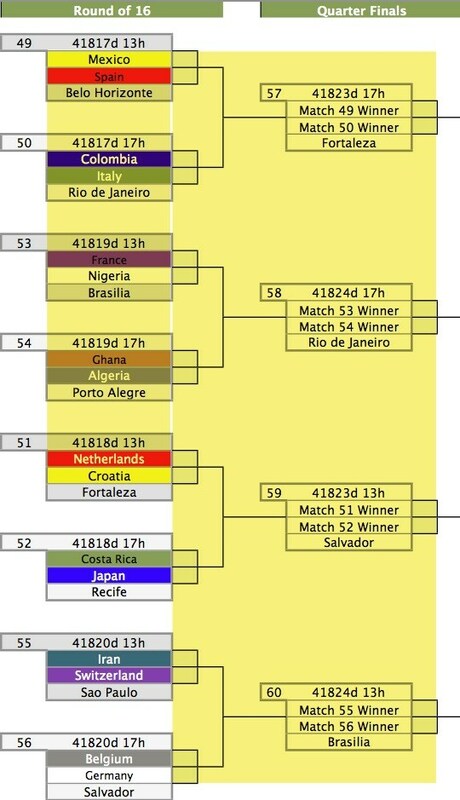 Results from Day 13 meant that Group’s C and D was complete, seeing Columbia and Japan qualifying from group C and … as well as Costa Rica and Italy from group D.
Meanwhile, day fourteen results meant that France and Switzerland qualified from Group E and Iran and Nigeria did from group F.
Firstly, Spain vs Mexico followed by Mexico vs Spain. Then Italy vs Columbia followed by Columbia vs Italy. The first of the round of 16 began with tournament favourites and hosts Brazil taking on a high-in tempo– and many people’s fancy to cause a surprise– Chile.The first half was a fast and furious affair, carried along by the loud and tense home crowd. David Luiz got Brazil off to a perfect start, flicking in from close range with a helping touch off a Chilean defender. Chile were not to be outdone, and soon enough mad the match all square, Alexi Sanchez finishing well after Brazil lost possession from a throw-in deep in their half. Poor play indeed. There were chances at both ends, with maybe the home side shading it. Neymar was lacking his shooting boots, and there was no shortage of missplaced passes, but it was energetic and intriguing. After the break Hulk had a goal ruled out for handball, but it was a call that the majority who saw it thought was the wrong one. The ball hit more inside of shoulder than arm, but the ref made his decision and Hulk’s finish beyond the goalkeeper was chalked off, to the obvious chagrin of the ‘scorer’. Both goalkeepers were then called on to make saves (though not at the same time), from Aranguiz and Hulk respectively. As Brazil pushed forward for a winner they couldn’t find that final ball. Their play remained unconvincing; dodgy at the back, long balls, and a lack of a midfield playmaker in the mould of a Vidal or Pirlo. In extra time Brazil were the better side, at least in terms of possession, but were kept out by a well marshalled Chilean defence. Chile began to look dangerous on the break, and when Pinilla smacked one off the bar with Cesar beaten in injury-time of extra time, Brazilians everywhere had hearts in mouths. And so, alas, it was down to penalty kicks. Could the Brazilian players hold their nerve, withstand the pressure? The penalty shootout– that early in it had the minutes-earlier almost-hero, Panilla, missing his effort– ended with, inevitably, Neymar scoring the winner in style. Well, almost, Not before Gonzalo Jara stepped up to keep his side in it, but instead saw his penalty bang off the post. Pity the loser, but the hosts stay on in the competition. Just. Next to take to the field was the turn of Uruguay that was missing Luis Suarez (for football fans, that’s bad news), up against Colombia. Colombia start the brightest, and score through a wonder goal from 25-yards; James Rodriguez chesting-and-volleying. Uruguay decided now was a good time to start playing a bit, with their best effort falling to Gonzalez inside the box, but the goalkeeper was alert to palm it away. Early in the second period Colombia doubled their lead, Rodriguez side-footing in from close range after a nice team effort in the build-up. Uruguay were now almost out of it, and as the clocked ticked down the closest they came– apart from being reduced to speculative shots– was a Pereira chance that the Colombian goalkeepr David Ospina blocked well. Next up for Colombia? Just the little matter of Brazil. One gets the feeling that– despite Colombia’s attacking flair– Brazil will be quietly confident of a place in the semifinal. Costa Rica vs Japan and Japan vs Costa Rica. Soaring temperatures in Fortaleza saw a water break allowed after half an hour, as the Dutch, obviously, were finding conditions especially tough going against Mexico in an intriguing game. The first period saw Holland with most of the possession, playing across midfield slow-paced, awaiting their opportunity as the Mexicans stood off. When Mexico got the ball they were faster and decisive, and indeed had the Dutch goalkeeper the busier of the two ‘keepers. A Dos Santos effort, following a lovely Peralta flick, was deflected away by Cillessen. Other than this both sides had decent penalty shouts waved away, as the half played out zero apiece. The second half opened up and quickened once Dos Santos drove home a left footed beauty to give Mexico the lead. The team in front soon began settling for what they had (always a dangerous tactic) and, this coupled with the Dutch going three up top, it looked a matter of time before the leveler arrived. Keeper of the tournament Ochoa was not about to let this happen, though, blocking several Dutch chances, one in particular off the goal line almost unexplainable. But in the end the almost inevitable occurred, as the otherwise ineffective Wesley Sneijder drilled home a loose ball in the Mexican box. Just as extra-time loomed, Arjen Robben felt contact in the box, dived embarrassingly, and won the team in orange a penalty that substitute Huntelaar made sure of. Cruel on Mexico. The night game was the ‘underdog tie’ between Costa Rica and Greece. The central American side’s up to now vim and winning mentality deserted them on the night, as the Greeks shackled them well, and generally dominated the game. Yet Costa Rica went ahead early in he second half as Bryan Ruiz passed one in beyond the unsighted Greek ‘keeper. The radio commentator described the goal as like a “golfing putt”. Greece came forward even more,– now with a man advantage after the sending off of Duarte who picked up two yellow’s– with Samaras involved in much influential play (while having a couple of headed efforts on goal himself). As the clock entered the 90th minute the tiring Costa Rican side finally wilted, and Greece made the match level through a Papastathopoulos goal. Extra Time continued with Greece having most of the ball as they tried to fashion another opening, rather than have to depend on those pressure penalties. As this endurance test continued things, as expected, were becoming extra stretched. But Greece continued to look the more likely, while their opponents hoped for a shootout. Mitroglou almost scored at the very end but the Costa Rican ‘keeper-man blocked with a leg. The penalties finally took place after what seemed about two-and-a-half-hours. All were hit well and with precision, until the unfortunate Gekas had his saved by an off-his-line Navas. (But this happens a lot these days and goes unnoticed). And so Costa Rica have the privilege of meeting the Dutch in the last eight. For more details and to keep up to date on the podcasts, released on a day by day basis, head over to worldcupofmusic.wordpress.com or follow @worldcupofmusic on twitter. Alternatively just point your browser towards this url: imojp.podomatic.com where you’ll find all the podcasts. All words by Guy Manchester, Zaph Mann and Phillip Neeson. You can find the post where we introduce the concept of the World Cup of Music here.